Today's Draw: The Wheel from the Gypsy Palace Tarot by Nora Huzska in the Attitudes and Thoughts position from the Deck of 1000 Spreads. Are things not going so great right now? Are you caught up in some sort of drama that feels like it will never pass? Or are you riding high on life and feeling untouchable? So I'm finally "back" after a few days of classic draws. I was traveling on business and too busy and/or tired to do the full blogging thang. 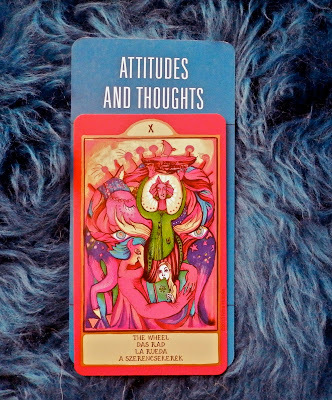 I had been awaiting this deck for sometime now and was glad to have it greet me upon my return to my normal routine. It's a very colorful deck. This photo does not do it justice. Anyway, the Wheel card is all about cycles and continual change. Many times I read this card as a change for the better. But today it has a bit of a different meaning for me landing in the Attitudes and Thoughts position. Today it seems to be talking about how fleeting and changeable things are in our lives. I'm a person who tends to get caught up in the moment, letting it color my world. Say, for example, I get a cup of coffee and then drop it, splashing java all over my outfit. I'm likely to decide, based on that one bit of input alone, that I'm going to have to muddle through "one of those days". Or say I get some excellent news about something. I'll walk through life like my feet were feathers and I'm surrounded by an impenetrable dome of luck. Stuff like that. I define my life by the moment I'm living now. It's not really the same as living IN the moment. For example, when I'm all sad sacked over the coffee incident I'm so preoccupied by my bad fortune that I miss a whole lot of good and neutral stuff that I could have used to color a better attitude. Truth is that our "luck", whether good or bad, is constantly changing. In fact, it's not luck at all, it's just the course of life. All "realities", good and bad, tend to change, so becoming attached to any way of being—wallowing in your depression or hanging on to your happiness—is just a waste of energy. We don't have control over all the factors that impact our attitudes. But if you don't like where you're at right now, just wait. The tide will eventually wash in a new hue to brighten your blue. Right now my house must have a dozen flies in it. This happens every year about this time. I don't know what it's all about, but it's an annual event. I don't think they come in through the door, otherwise they'd always be in here. It's just a phenomenon that lasts about a week. I remember it really bothered me the first year. I went around killing them, but could never get them all. What I know now about this situation is a) it gets worse before it gets better and b) flies die on their own in a couple of days. My dog Mystic is trying to hunt them down one by one. But me and Magick and Kizzie? We're just waiting them out. The same is true about life. Things get worse. Then things get better. So if you're stuck in the "worse", it's a whole lot less stressful to wait it out than to go around trying to exert control over it. Control is an illusion. Things happen with or without you. Best to just let them pass on their own. I love your thoughts on flies. Your post made me both smile and think. Wisdom really is uncomplicated when you think about it, isn't it? Thanks for that. Made me look at things in a different way.